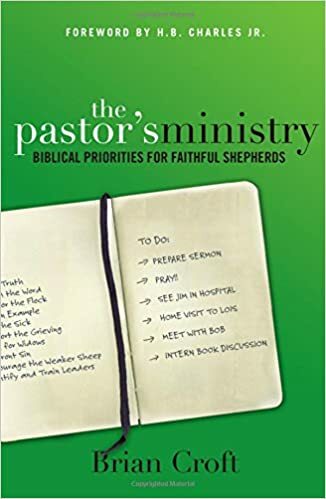 Pastor Brian Croft of Auburndale Baptist Church in Louisville, KY and founder of Practical Shepherding wrote a trilogy of books for the pastor. I read them completely out of order, reading The Pastor’s Soul first (here is my review), then The Pastor’s Family (here is my review), and now finally The Pastor’s Ministry. The others were good; I gave them both four out of five stars on GoodReads, but this book was stupendous. At only 180 pages, it is probably the most practical of all pastor-help books I have ever read (and I’ve read plenty). Published by Zondervan in 2015, The Pastor’s Ministry dives into the nitty-gritty details of, well quite frankly, a pastor’s ministry. Pastor Croft divided the book into three parts (as any good Baptist preacher will do). Part one: foundation; two: focus; three: faithfulness (it’s even alliterated!). Seriously though, I found myself underlining wonderful truths to take away in every chapters. The first three chapters that make up part one deal with the whys of ministry. “Pastors are the appointed guardians of God’s truth, and above all else they must hold firm to it, boldly refuting those who come against it and passing it on to the next generation of appointed guardians,” (p. 27). He reiterated, “If we lose the truth, we have nothing left. But if we guard the truth and make it the lifeblood of our ministry, we labor in the work that the Spirit empowers and through which he breathes life to our souls and the souls of our people,” (p. 36). Thus, preaching the word and praying for the flock are the foundation to any ministry. By the time we get to the second part, the author has pressed upon the reader the importance of doing ministry correctly and faithfully. The question is how does one do the ministry of the pastorate? This is where things got good; as I said this is the most practical of all pastor-help books. Parts two and three deal with the hows of ministry. How are we to set an example? How should a pastor act and what should he do when visiting the sick? How can he comfort those who have lost loved ones? And my personal favorite: how to care for widows. In fact, this one chapter was so helpful, it gave me an overwhelming desire to read his book on this very same subject. Again, these are practical guides that are given and so he deals with spending time, sending notes, giving gifts, etc. “Ministering grace to a widow with a gift is about more than just the gift; it is also about the message you communicate by giving the gift. . . .Such gifts can powerfully remind a widow that she is not forgotten,” (p. 123). Part three is still a continuation of how, but in a different scope. These are the hows of spiritual guidance. How and why should one confront sin? How does encouraging the weaker sheep help them, the pastor, and the flock? “Compassion is most clearly displayed in our care in those moments when we are frustrated and ready to give up–but then we don’t. We press on. We try again. We speak the same encouraging words we’ve spoken many times before in the anticipation that the Spirit of God will one day allow them to stick,” (p. 155). And of course at last–because it is so important–how to find the next generation of appointed guardians? I truly believe that any Bible College and Seminary should at very minimum use this trilogy as supplementary books for their pastoral students. These books, if read and heeded, will save young (and old) pastors much heartache and a few headaches as well. I wish these had been written earlier, but I am so happy to have them now. One book reviewer on GoodReads gave this book two stars, claiming it was basic and what was written in these pages could and should be learned by shadowing a pastor. Perhaps so, but not everyone has the ability to shadow a pastor. That’s why we have books. Face to face teaching is best, but when that is not possible due to time, distance, or ability, a book like The Pastor’s Ministry is a good substitute.